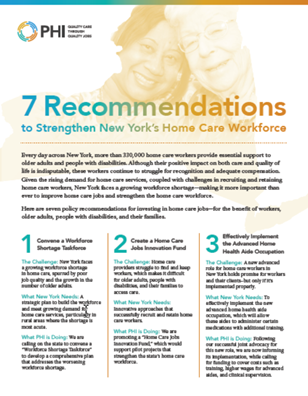 Given the rising demand for home care services, coupled with challenges in recruiting and retaining home care workers, New York faces a growing workforce shortage—making it more important than ever to improve home care jobs and strengthen the home care workforce. Here are seven policy recommendations for investing in home care jobs—for the benefit of workers, older adults, people with disabilities, and their families. Every day across New York, more than 330,000 home care workers provide essential support to older adults and people with disabilities. We are calling on the state to convene a “Workforce Shortage Taskforce” to develop a comprehensive plan that addresses the worsening workforce shortage. We are promoting a “Home Care Jobs Innovation Fund,” which would support pilot projects that strengthen the state’s home care workforce. Allison Cook is the New York Policy Manager at PHI. 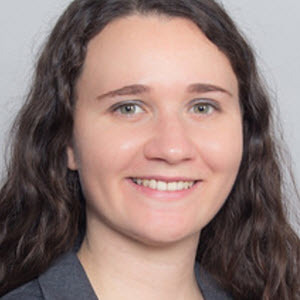 Her work focuses on New York policy issues affecting direct care workers, including Medicaid, public benefits, training, career advancement, and workforce development. Better data is needed to track the workforce and understand where gaps are occurring. We've launched a two-year campaign to help solve the country's caregiving crisis. From wages to employment statistics, find the latest data on the direct care workforce. A tax-deductible gift ensures everyone can access paid care to support their loved ones. Stay informed on the latest direct care news and updates from PHI.